In August of 2014… We spent time filming and photographing Cecil the Lion, Jericho and their pride. 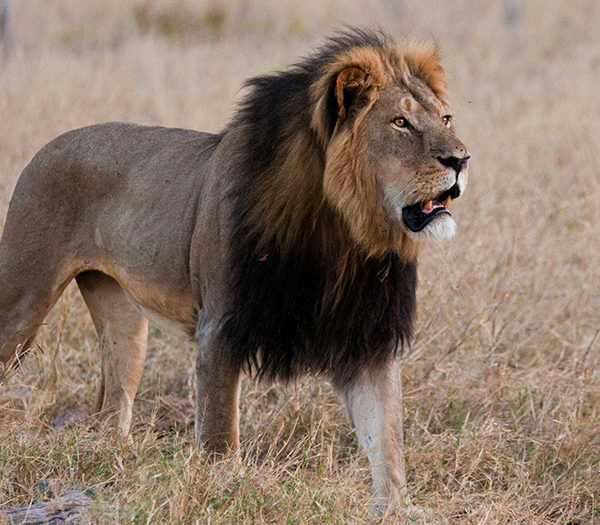 In July of 2015… Cecil was killed by an American dentist. For “sport”. In August 2017… We return to Zimbabwe. This time will be different. Because this time… we return with a purpose. A purpose and resolve and a mission to extend our Community’s reach, strengthen our ties, expand our existing Community in Africa and educate us further. To learn more about the great challenges we face in eradicating the trophy hunting of Africa’s threatened and endangered species. Last time we were tourists. This time… we want to bring you with us. 18 very fortunate Community members will have the chance to join Pamela and I in our return to Hwange National Park, home of Cecil’s pride, and to Victoria Falls, one of the great natural wonders of the world. Our journey will include meetings with conservationists, park rangers, anti-poaching units and researchers; all highlighted by spectacular game drives to observe the incredibly wide variety of wildlife in the Park. Hwange National Park is Zimbabwe’s biggest reserve, home to a profusion of wildlife, including giraffe, lion, zebra and approximately 40,000 elephants. It provides sanctuary for all the country’s endangered species, including a population of wild dogs thought to be among the most sizeable surviving groups on the continent. Terrain ranges from desert dunes and savannah lands to rocky outcrops and sparse forests. We will learn about and experience the Lion Research Program in Hwange and will also take in the Wild Dog (Painted Dog) preservation project and other activities undertaken in Hwange National Park to protect Zimbabwe’s precious wildlife. The Lion project is run under the auspices of the Wildlife Conservation Research Unit (WildCRU) of Oxford University’s Department of Zoology, which has grown to be one of the largest and most productive conservation research institutes in the world. Your community friend and supporter, Brent Stapelkamp knows we are coming and will make an effort to spend time with us, schedule permitting, to talk about his research. And what we can do to support his now global efforts to saves Africa’s big cats. This trip of a lifetime has been handcrafted to provide exposure to the conservation efforts underway in Zimbabwe as well as view its amazing wildlife up close in their natural environment. This is an exceptionally unique opportunity to get behind-the-scenes with on-the-ground conservationists, to experience and travel through Cecil’s territory and hopefully visit and photograph his pride. The price for this adventure includes everything listed in the detailed itinerary below and will provide for the ultimate in comfort camping and safari experiences. Additionally, for each individual who books, Exclusive Adventures and CeciltheLion.org will donate $500 to Friends of Hwange Trust to assist in their efforts to maintain sustainable water resources for the dozens of species who live in and travel through Hwange National Park. We hope you can join us on this amazing journey to learn, experience and help in preserving Cecil’s descendants and all the animals of Zimbabwe for future generations. Last time we were tourists. This time… we’re on a mission. Let the adventure begin! Join us on this Unforgettable Zimbabwe Safari!